ClockOnTop freeware for smartphone, Windows mobile phone free downloads. 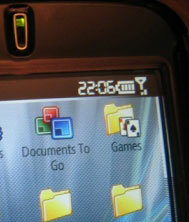 ClockOnTop which allows you to add a digital clock to the top bar (known as the taskbar) of Windows Mobile. It adds a feature that should have been there by default. if you want the 12-hour format, you will need to replace the ClockOnTop.lnk in the Windows > Startup folder with the one in the ClockOnTop ZIP file. Make sure the ClockOnTop.lnk file is in that folder before placing the replacement lnk file in there. What a sweet little find. Thanx. But WHY do these little apps always make me feel like a complete Dolt? This sounds like doubletalk to me and I cannot decipher what link file gets replaced with what zip file to get the 12 hour setting. I only see one link file in the download and none in the exe file. I just don't get it. Yeah I don't get where to put the files, any help guys? Thanks..
in the zip file is another shortcut file. you gotta take that file and overwrite the file in \windows\startup with it. my problem is that after ive done that, its in 12 hour mode, but theres a chinese character next to it. how do i get rid of it? can't get it to work. it will only appear on the taskbar when I run the program, but when I exit to the home screen it disappears. Suggestions? i really cant figure out if you need to download these things to your pc 1st or what? when i try and download it to my dash from here it always says "not visiable on this device" being the picture has it on the same phone as me I can tell it works,i am a complete neophyte in regards to these things but Im trying,if any1 has any help they would like to hand out that would be very great. thanks for your time. bqjones: the program is not meant to be running when you are viewing your homescreen, presumably because you have a clock there anyway. it only shows up when you have navigated away from your homescreen. rednose: not sure what the problem is, exactly, but you need to extract the zip file and copy the .cab file to your device and run it from there. check out modaco.com for some great tips and advice. What's the point in installing this? I prefer to keep track of the time with my watch! The asian characters says am or pm in chinese. Not sure if there is a way to change that. There's a fix for the Chinese characters. Visit http://www.jamerican.net/?page_id=32 and scroll down to "Update 2" and follow the instructions there. Works great on my Motorola Q9h! Any way to make it stay on the home screen too? and I cant find a /windows/startup folder with the ink file in it to replace. Im using wm6 so Im sure its somewhere else but I cant find it. Any ideas? Works perfectly, even in WM 6.1. Thanks a lot! Can't seem to get it to work on my Moto Q9h :( Any website with installation instructions? Thanks a bunch. This is a great little clock. I agree this should have been a gimme with the phone. Great little program. So much better not having to exit a program just to see what time it is! It's always a relief when someone with obvious expertise anrsews. Thanks!